Celebrity Gossip > The Breakfast Club stars reunite! The Breakfast Club stars reunite! 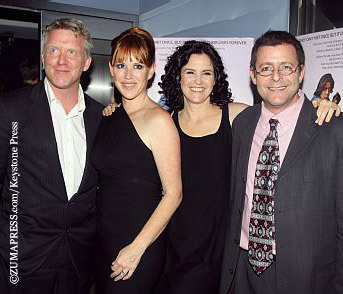 Anthony Michael Hall (nerd Brian Johnson), Molly Ringwald (popular rich girl Claire Standish), Ally Sheedy (weird girl Allison Reynolds), and Judd Nelson (tough guy John Bender) reunited at The Breakfast Club 25th Anniversary Screening in New York City. Emilio Estevez (jock Andrew Clark) was the only one absent — he was reportedly working on a movie in Canada. The event was hosted by hosted by the Film Society of Lincoln Center, and also served as a celebration of the film’s writer/director, John Hughes, who passed away suddenly last year. He was responsible for a number of extremely popular teen movies, including Sixteen Candles and Ferris Bueller’s Day Off, which scored the highest in Tribute’s recent poll: What’s your favorite high school movie?, garnering 26 percent of the votes. The Breakfast Club came in second with 22 percent. At any rate, it’s great to see the gang again — they all look amazing 25 years later! I love this movie, weird to see them all grown up now! Me too, I love that movie, I’ve seen it at least 10 times. By far the best teenage movie ever. It will live on for years to come and I intend to have my kids watch it when they’re old enough. There’s a really good message in this movie for kids and parents also. WOW, they all look great! Molly Ringwald looks way better now than she did years ago…she grew up into a pretty swan. I barely recognize Anthony Michael Hall, but he looks great! Surely not the skinny ‘geek’ he was in that movie and in Sixteen Candles. The Breakfast Club still ranks as one of my favourite movies of the 80’s. Everyone can relate to the movie on some level and it certainly brings back some great memories of the fashions, hair and music. Although it’s been 25 years, all of the actors look fabulous and I look forward to seeing them in a movie in the near future! I “dug” it back then, but don’t know if I’d bother watching a “reuniting” movie, with the three of them. In the original, I felt that Mollie Ringwald and Estevez were the best two actors in it. I think they turned out the “better” looking of them all! The movie was pretty “decent” tho’. Or if someone asks me to repete myself “do I studder”…. or when I’m doing something different “I can’t believe I’m actually doing this”..
Just my favorite movie of all time (yup, I’m a dork). I liked the movie when it came out, but the more I watched it, the more I cut it up. Same with “St. Elmo’s Fire”. Had its day, though. The stars look old and over weight. I saw each of them, as they aged. I am not in the media, but I am 50 and I look 30. I am 115 lbs., and 5′ 5″, and have all of the curves and a flat stomach. (my own thing since I was a kid). I do nothing special to stay this way. Lucky, I guess, but when in the medai, one would think that there would be more up-keep. Not that I am against people aging gracefully, but… Anthony Michael Hall looks the best. The movie, like I said, had its day. Don’t mess it up with a reunion movie! its superficial to expect everyone in the world to be skinny and age well. who cares if they are a little chunkier than they once were? they still look amazing, and they are still alive. Well Debbie I think that you are a little narcissistic! Who cares what you look like when you were 30 or 50!! The article is about the Breakfast Club cast, not how good you still look. You could be 500lbs male for all we know. Agreed, MW. Any any 50 year old who thinks they look 30 is fooling herself. Or believing other people when they lie to her and say she looks 30 because they’re joking or trying to be polite. I could see looking a few years younger but not 20 years. And I don’t think any of these actors look either old or overweight. The girls especially haven’t changed much, and the guys look like they’ve filled out a bit and matured, and Anthony Michael Hall especially needed to fill out, he was a skinny little teen back then. I think Judd Nelson actually looks even more handsome here than he was in the movie — I loved him as John Bender and would love to see him in something today. Just comes to prove the point that it’s the geeky guys, not the tough guys, who have the last laugh in life, who usually go on to be successful and even better looking than the cool/tough guys in adolescence. Smart girls know this. Stupid girls end up with the bad boys, who usually end up ruining their lives. Molly Ringwald has reevaluated some of her classic movies and revealed she doesn't approve of the inappropriate sexual assault humor in Sixteen Candles.